Screen size: Up to 350"
Screen size: Up to 304"
If you want to relax in the comfort of your very own home cinema then look no further than a tv projector, which in recent years have become super-affordable, compact and brimming with features. Many come with HDMI standard inputs and resolution, giving you the ultimate display. A projector will also be measured in lumens, which quite simply rate how bright the projector is, and therefore the quality of the display. 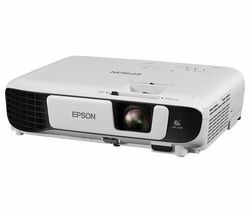 If you’re looking for something to carry around with you then our range of portable projectors is ideal. Small, lightweight and obviously portable, they make a perfect partner for a businessman on the move or a creative who needs to bring designs to life. Portables come in a variety of sizes, from palmtop or pocket sized, to larger, brighter models which are still very portable. 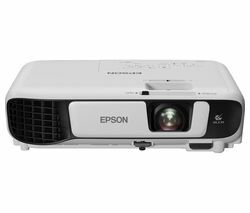 For a good idea of the top spec projectors you can buy, take a look at our variety of Epson projectors, which have some of the largest possible screen sizes on the market at over 300 maximum inches in super-sharp resolution. Whether you’re looking for a fully fledged home cinema or a pocket-sized portable projector, our range has something to suit everyone to take your display to the next level.